‘Occupy’ movement forced out of Wall St. Although it was the middle of the night, Mayor Michael Bloomberg’s message to the “Occupy Wall Street” protestors was clear as day. All of the protestors in Zuccotti park, the eye of the “occupy” storm, were forced to get rid of their tents, pack up their sleeping bags, and leave peacefully in order to clean the park. Hundreds of members of the New York Police Department (NYPD) were present in order to ensure an orderly exit. In previous attempts to evict the squatters, the police had used pepper spray, which violated NYPD rules in addition to generating a wave of public sympathy for the protestors. As soon as the people were kicked out of the park, which was chosen for its proximity to Wall Street, they immediately filed an emergency appeal with the National Lawyers Guild. The civil rights group claimed that there was a free speech element at play which the Mayor’s evacuation violated. Mayor Bloomberg stated that “the city has two principal goals: guaranteeing public health and safety, and guaranteeing the protesters’ First Amendment rights […] but when those two goals clash, the health and safety of the public and our first responders must be the priority,” (Washington Post). A judge ruled Tuesday afternoon that the city had “the right to enforce rules against the park” (New York Times), and while the city re-opened the park after cleaning, the protestors were forbidden from bringing camping equipment back onto the park grounds. This poses a contrast to the Occupy Oakland movement, when the dismissal of the protestors turned violent. As the police razed Snow Park, they shot rubber bullets at many of the demonstrators. In a particularly infamous incident, a former Iraq veteran, Scott Olsen, had his skull fractured and was only recently released from Intensive Care. 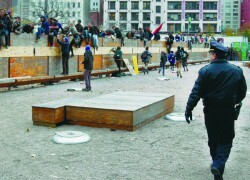 Zuccotti park’s evacuation occurred almost two months to the day after the “Occupy” movement started their protests. The people affiliated with the movement — who call themselves the “99 percent” — are complaining about economic inequality, corporate influence over political parties, and unemployment.